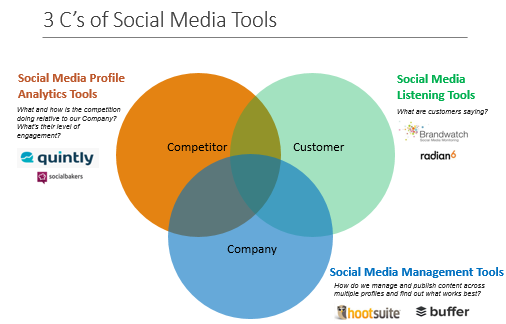 The 3 C's can also be applied to social media marketing tools. How do we manage and publish content across multiple profiles and find out what works best? This is all about how the Company expresses their "human side" online and engage with its customers. Once content is produced, companies need to distribute all that content in the right social spaces. Few companies manage each social space (e.g., Facebook, Twitter) directly from the sites themselves. Most brands use social media management (a.k.a., publishing or community management) tools to manage content and plan, schedule, and track the success of their social media campaigns. Popular tools in this category include Hootsuite and Buffer. Listening, or conversation monitoring, tools have been around for about a decade. I consider such tools the world's largest consumer research panel...on STEROIDS! Conversation monitoring tools can range in price and sophistication. On the free end of the spectrum, one can use good old Google search, as well as vertical search engines like Omgili. But these free tools just return a list of search results -- mainly unstructured data that is extremely hard to analyze. Then on other end, there are powerful, useful tools such as Radian6 and Brandwatch. These tools crawl the web based on keywords. Data is organized around mentions, sources/source types, or influencer/author. Listening tools are great for qualitative insights, such as trending topics and finding key influencers, and identifying places on the web (not necessarily social networks) where people are talking, such as forums, blogs, and communities. The main outputs from such tools are tag clouds, key topics, sentiment/tonality, and influencers. What and how is the competition doing relative to our Company? What's their level of engagement? This is a newer category that has been around for about half the time of listening tools. These tools provide competitive benchmarking between branded social media profiles. I personally think calling them "social media analytics tools" is a little bit vague and doesn't really convey what these tools do. So I like to call them "social media profile analytics tools." Unlike listening tools, these tools crawl pre-defined social media profiles that you configure (e.g., @starbucks, www.facebook.com/Starbucks). Data is organized and structured primarily around these social media profiles. These analytic tools are great for quantitative insights, such as growth of fan base, engagement level between users and the branded profile, types of content posted by brands or fans, and types of post that drive engagement or sharing. If I'm Starbucks, is Peet's fan base more engaged than mine? Do they tend to post more pictures, videos, or comments on their Facebook page? There is no shortage of competitive comparisons one can do. Here are 2 fun analyses I previously wrote about using one of these tools: most engaging auto luxury brand and can Facebook stats predict Super Bowl winner. All this data can easily be analyzed longitudinally across time to identify trends within a profile (e.g., how has things changed quarter over quarter?) or across various competitive profiles (e.g., is our engagement rate higher than our competitor?). The main outputs are trend charts, frequency distributions, and rates/ratios. Popular paid tools include Quintly and Socialbakers. There really is no free option here as all the historical data is not really archived anywhere on the open web, not even Google. There are tools that are now becoming more popular that claim to do all of the above on one platform, such as Sprinklr. Some might say these suffer from being a "jack of all trades, master of none." But it really boils down to your social media marketing level of sophistication and analytic prowess. For some clients, they don't need to go deep in all 3 areas and that's ok. Others enjoy drinking from the fire hose. All 3 tools and capabilities are important for major brands. In my experience, I find most clients are using a premium product for the Customer and Company parts, but not so much the Competition piece. I think it's largely a product category awareness issue. Many brands and agencies I work with simply don't know Social Media Profile Analytics tools are available and insightful. And because of the way the data is structured, you really can't use the social listening tools to analyze things at the social media profile level. So whether you sign up for the stand alone Social Media Profile Analytics tools or some of these newer "all-in-one" suites, it's critical for brands to keep an eye on the competition. Otherwise, you've only got 2 legs on your 3-legged stool, which means you'll just fall flat on your face.